A recent survey of over 2,700 mobile developers revealed that devs universally prefer developing for iOS (formerly iPhone OS – renamed iOS recently, as it is now used on the iPad). 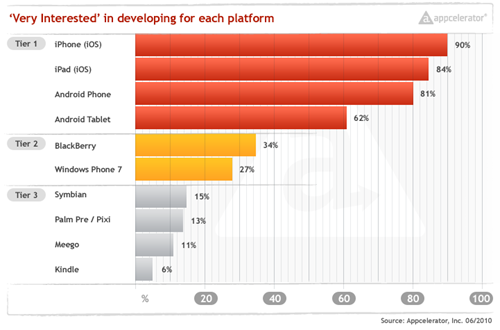 Apple ranks #1 in mobile phone market share, and there are more than a few stories of small-time devs creating apps for the iPhone that took off overnight, so it really isn’t all that surprising that Apple was a dev favorite. 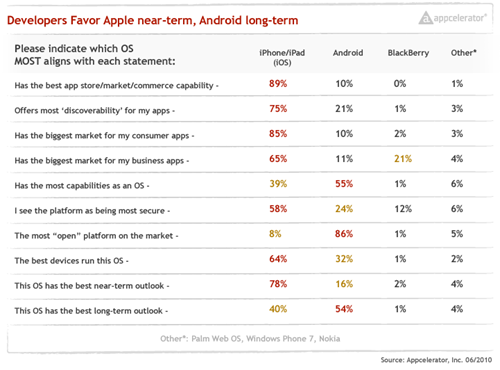 Still, with Android picking up momentum at an exponential rate, I have to admit I was a bit surprised that Android didn't score closer to iOS. After all, in the past month, Android activations have increased 60%, and there are now more Android activations per week than iPhone, iPad, and Mac activations combined. Not only that, but a short while ago you couldn’t check out tech news without seeing an an article about Apple’s murky requirements for app approval (a serious negative for developers). 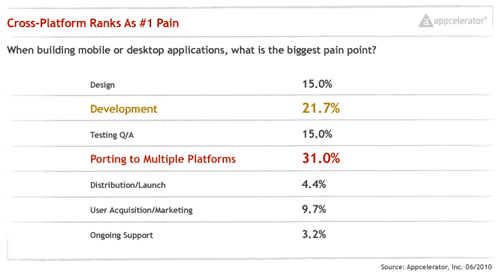 The survey was run by Appcelerator, the makers of a program that facilitates App development.